We’re starting a new series here at Ranty McRanterson, entitled Video Games Based on Classic Novels. The first installment of this series is about the Xbox Live Arcade game, Geometry Wars: Retro Evolved. It is a little known fact that this game is actually a futuristic portrayal of John Steinbeck’s classic, The Grapes of Wrath. You begin the game as Tom Joad, and your goal is to destroy as many migrant farm workers ( your competition as you make your way across the country to California) as you can with a machine gun. These migrant farm workers, and in the later levels, government officials, are represented by geometric shapes, such as the blue diamond farm workers in the screenshot below. The more migrant workers and government representatives you kill, the more points you accumulate. Eventually, your machine gun gets upgraded to a wider blaster ray gun, in order to increase the carnage, which is representative of Tom Joad’s character development throughout the Grapes of Wrath. 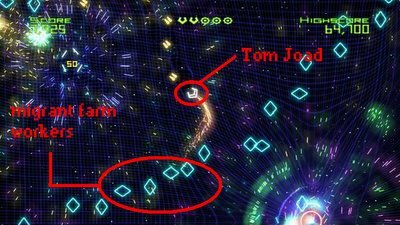 As you near a million points and countless government officials beaten down, the pride and resolve of Tom Joad is visible in his ability warp the space-time grid in the background as well as his ability to navigate through the chaotic maze of geometric shapes that now inhabit the United States. The high definition graphics and realism of the game make you feel like you’re reading the book. You really begin to feel inspired by Tom Joad’s tenacity. This is one of the best book to video game transitions I have ever seen.